On one of our recent Socorro trips, we welcomed Marine Biologist Miguel Ortiz on the Nautilus Belle Amie. 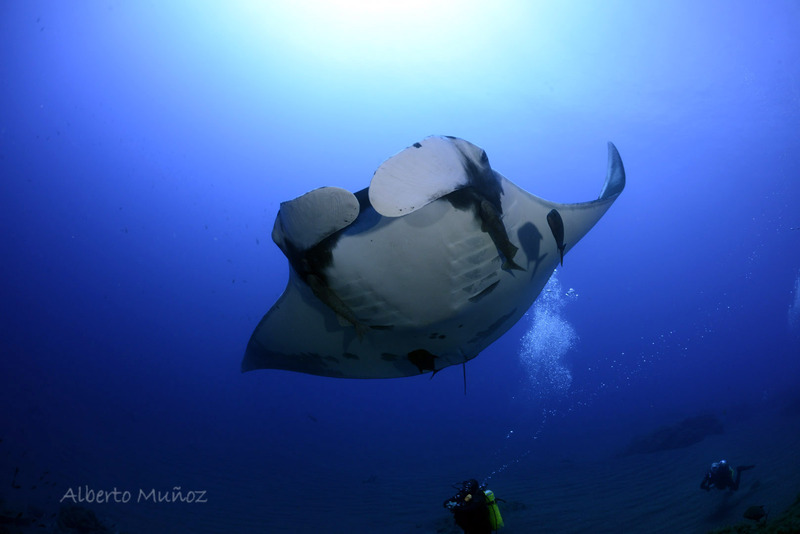 Miguel sent us this summary of his trip and the important work he did onboard, including giant manta identification, and more. 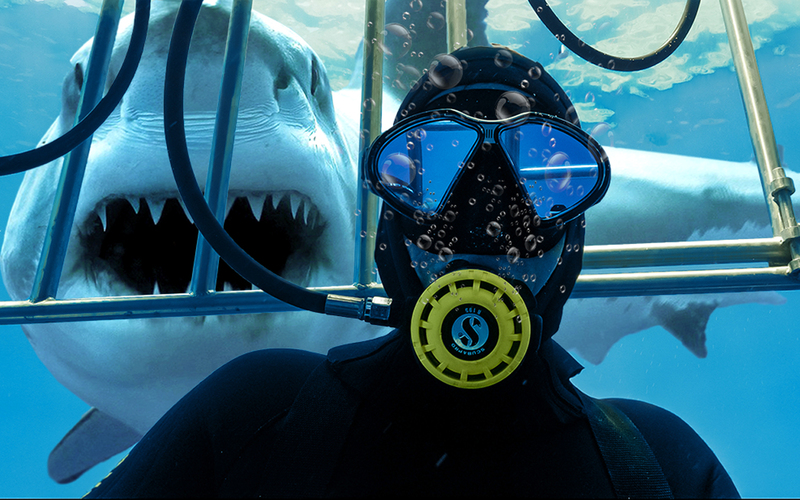 I just returned from a great expedition to the Revillagigedo Archipelago onboard the Nautilus Belle Amie liveaboard. I am a Marine Biology student, and I graduated last December from the Universidad Autónoma de Baja California Sur (UABCS). My next (and last!) step is to get a degree through a thesis. The title of my thesis is “Movements and site fidelity of the giant Manta (Manta birostris) in the Archipelago of Revillagigedo 2015-2018.” In order to perform it, I worked with giant manta identification to differentiate each individual, and thus evaluate their population. This helps to obtain important information including how many individuals are in the biosphere reserve, how many mantas are present every season and if there are new mantas every season. It also includes which islands attract more mantas, how many females and males are there, and how the mantas move between the islands. During the trip, I took photographs for giant manta identification. I also conducted marine life surveys (a visual census of the reef and pelagic fish community), in order to understand the current population status in the Revillagigedo National Park and get useful information for the conservation of the marine ecosystem. Additionally, I gave presentations to the guests and crew onboard. My first talk was about my thesis, commenting on my experience as a marine biologist, and what I was going to do during the trip. The second presentation had to do with the giant Manta, from its evolutionary origin, including its ecological and biological characteristics, to its current global situation. The presentation also touched on the fishing pressure that currently exists and has existed in the past on these organisms, as well as the alternatives that exist to counteract it. During this presentation, the guests were very interested and asked many questions when I finished. The following presentation was about my project, what I have been doing for the past couple of years and some preliminary results that I have so far. 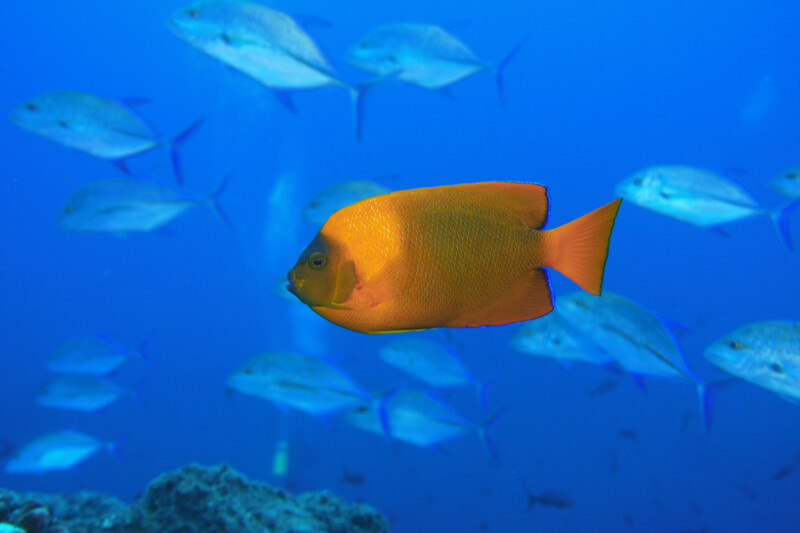 It was followed by a short presentation about the endemic Clarion Angelfish of the Archipelago, including its biology, ecology and the aquarist trade that exists today, which is currently the main threat to their species. During the dives in the Boiler (San Benedicto) and Roca Partida, I did 18 different visual censuses at different depths (30m, 20m and 15m) to characterize the population of reef and pelagic fish. I recorded the scientific names of all the different fish, including the Chinese trumpet, the leather bass, groupers and triggerfish. There were also many of the big pelagic fish such as jacks, wahoos, tunas and skipjacks. 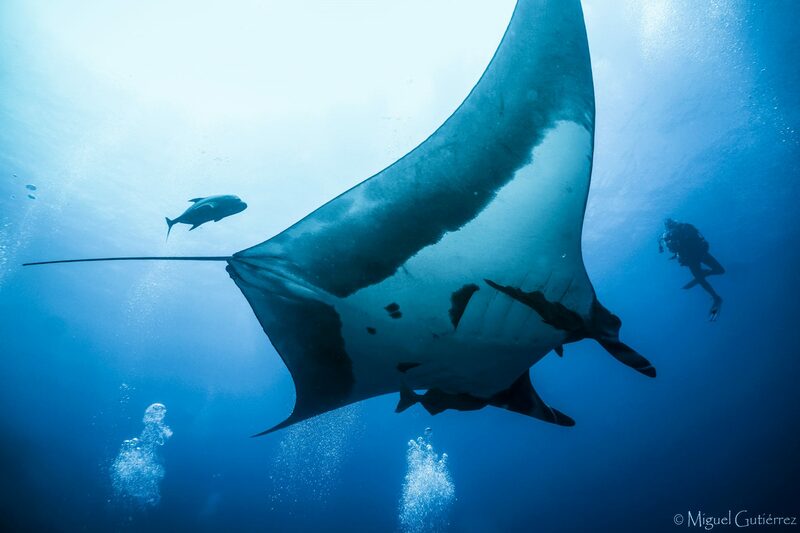 Photographs were taken of the Mantas ventral region (belly) for further photo identification. I identified 8 different mantas: 7 chevron and 1 black. In total, we have identified 330 different mantas in the Archipelago in the last 3 years. Two seasons ago we identified 154, and last season we identified 176 mantas. We have not yet finished identifying all the photos from this year yet, however, there have been many new individuals. In the end, I registered 8 species of sharks, including one whale shark, one black tip, one baby tiger shark, some hammerheads, more than 100 white tip reef sharks, some silver tips, many silkies, a group of Galapagos, and 1 ray (Giant manta). Roca Partida was the site with the highest number of species and abundance. 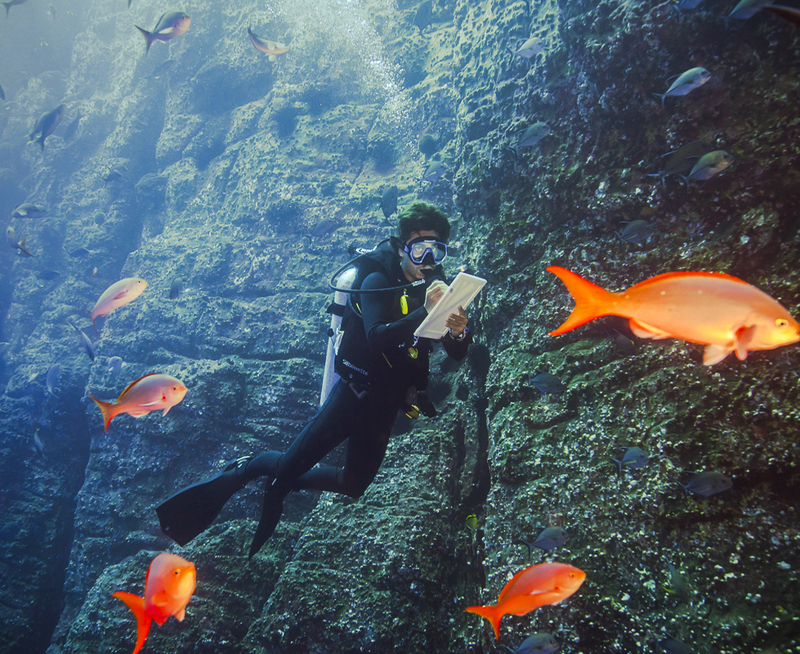 On this trip, we registered important information on the marine life in the Revillagigedo National Park. This information will be useful to create tools to support the conservation efforts. 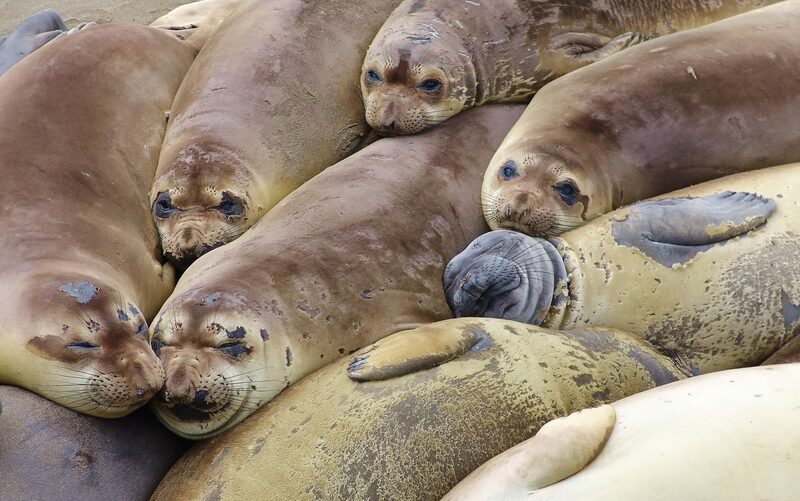 I want to thank Nautilus liveaboards who are working together to conserve our oceans. Also, big thanks to all the crew who supported me immensely and taught me everything I needed to do to improve in my work and to have a great time in the Archipelago. First Blogs from Guadalupe 2018!